Support of the social environment by AB S.A.
AB S.A. has actively helped and supported people in need for years. Not only does it co-operate with existing organisations, but also it encourages employees to act and undertakes its own initiatives. One of them is “TB Paka dla dzieciaka”(TB's Package for a Kid) – a campaign which is held in the Christmas period every year in co-operation with the “Mam Marzenie” (I Have a Dream) Foundation. The aim of the campaign is to support the poorest families. People in need receive help every time the customer buys TB Print (AB's own brand) products for a specified minimum amount in the pre-Christmas period. In such case, people under care of the Foundation receive a package with gifts containing, among others, school accessories, bed linen, towels, clothes, kitchen accessories, cleaning products and household chemicals. Apart from that, AB S.A. offers participation in the „TP Partner” program to its business partners. In return for purchasing products of AB's own brands, participants receive points, which they can convert into gifts, but they can also designate them for good cause – the support of the “Mam Marzenie” Foundation. Moreover, AB adds the same number of points in its own name to each number of points submitted by the customer in favour of the Foundation. In this manner, the company wants to encourage its business partners to engage in helping together and to fulfil as many children’s dreams as possible. AB S.A. co-operates with the “Mam Marzenie” Foundation also by organising fund-raising events among its personnel. The personnel of the Wroclaw-based company received the Marzenka 2013 award from the Foundation in gratitude for their continuous engagement in helping people under care of the Foundation since 2011. AB S.A. has also joined “Ciuch w ruch” (Move the Dress) – an environmental campaign aimed at reducing the consumption of natural resources. As a means of promotion of environmental attitudes among the company's personnel and the Wroclaw community, a special environmental container made entirely of recycled paper has been installed on the premises of AB S.A., into which secondhand clothes and other textiles can be put. For each kilogram of clothes collected by companies participating in the campaign, a specific amount is paid to the account of the "Mimo Wszystko" Anna Dymna Foundation – until now, the total amount of several thousand PLN has been contributed. For many years, the company has also helped children under care of the Children’s Home in Bierutów, Family Children’s Homes in Wroclaw and the Wroclaw Hospice for Children. In the pre-Christmas period, AB S.A. traditionally contributes funds for the purchase of most necessary articles of daily use, i.e., personal care cosmetics and cleaning products and toys, school accessories and clothes. Employees of AB S.A. also engage in the support of children's homes and the hospice by offering their work and private time. 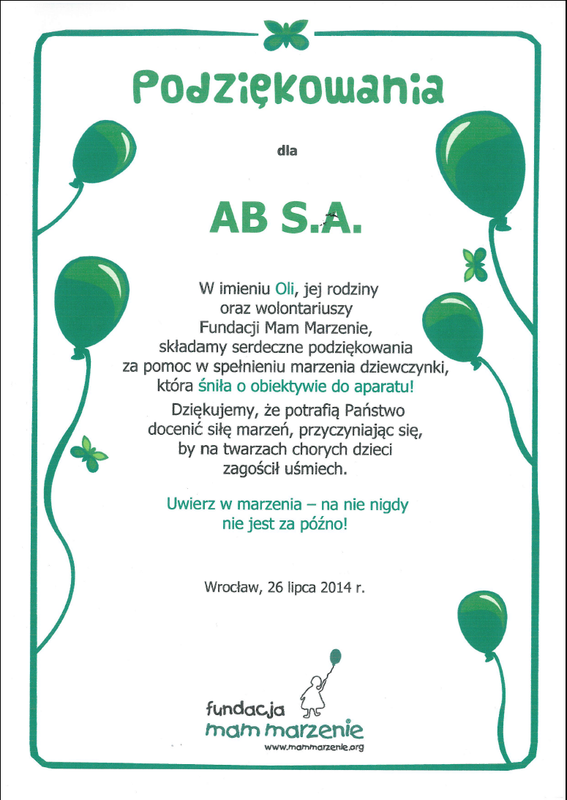 AB S.A. supports also the “Dziecięca Fantazja” (Child’s Fantasy) Foundation, which fulfils children’s dreams. Apart from that, the company participates in the annual “Szlachetna Paczka” (Generous Package) campaign aimed at helping families in need. Support of the natural environment by AB S.A.
AB S.A. acts not only in favour of the social environment, but it also takes care of the natural environment. In 2013, the company adopted an Environmental Policy, which officially focuses, among others, on preventing the formation of contaminations, elaborating goals and tasks related to environmental aspects, ensuring the high environmental awareness of employees or providing customers with charge-free access to worn-out electric and electronic equipment. - the company reduces the use of paper: employees make use of an electronic fax, e-invoices are offered to dealers, and bank statements are booked and intra-company correspondence is sent only in electronic form. In addition, AB S.A. has implemented the Eco-Management and Audit Scheme [EMAS]. This system is a voluntary instrument confirming the constant improvement of ecological (environmental) efficiency within an organisation. It is the highest-level certificate in the field of environmental management in the EU. When implementing the a/m system in 2012, AB S.A. was the 32nd company in Poland and the first IT company that assumed obligations resulting from EMAS. At present, only 51 companies have this certificate in Poland. The validity of the certificate granted to AB S.A. has recently been extended for a further period of 3 years. We encourage you to visit the Foundation's website at www.mammarzenie.org. There are many more children's dreams waiting to be fulfilled! The AB systematically implements new CSR activities, which include the Sales Department Academy that enables employees from other AB departments to participate in a training program and provides opportunities to get a job at the Sales Department, as well as the "Creative Employee" contest which consists in rewarding employees for ideas on ways to make work at the company or any of its departments more efficient. For years we have provided aid and support to those in need as a part of such campaigns as "Szlachetna Paczka" and "Ciuch w Ruch." The AB is also working with a number of social organizations: Anna Dymna's "Mimo Wszystko" Foundation, the "Mam Marzenie" Foundation, the "Dziecięca Fantazja" Foundation, as well as with the orphanage in Bierutów, Family Orphanages in Wrocław, and the Wrocław Hospice for Children. We have fulfilled 17 children's dreams! We have helped 36 families in difficult financial situation. Together with other companies, we have collected 12,576 kg of clothes, which has resulted in a donation of 39,037 zlotys to Anna Dymna's "Mimo Wszystko" Foundation. Employees of the AB have been working with the "Mam Marzenie" foundation since 2011. In this period, we have had many opportunities to find out that nothing is impossible and even a small gesture can help people forget about pain and problems they experience when they get seriously ill. This is particularly true in the case of helpless children with serious diseases. We remember very well the first dream that we fulfilled: a 12 years old Kamila dreamed about an XBOX 360. This appeared to be a normal dream for any teenager but, given the serious illness of the girl and her passion for dancing, the XBOX gave her plenty of pleasure during her stay in the hospital. We had many opportunities to learn that it is good to have a dream, that dreams are very powerful, and that it is worth waiting for them to be fulfilled because there is magic not only in the fulfilling but also in the waiting, which takes one's mind away from the daily problems and concerns. With every dream that is fulfilled, children gain new strength to fight their diseases and we, as employees of the AB, become inspired. In December 2013, employees of the AB received the "Marzenka 2013" award, which is a great honor to us. Initiatives such as the "Mam Marzenie" Foundation are extremely beneficial. The most touching thing about them is that their value is measured not in money but in children's smiles. We are very happy that our efforts have been appreciated. We are proud and happy to be able to help the "Mam Marzenie" Foundation in its activities. This gives us not only great satisfaction but also makes us happy to be able to make children smile. We will certainly be able to fulfil many more children's dreams.